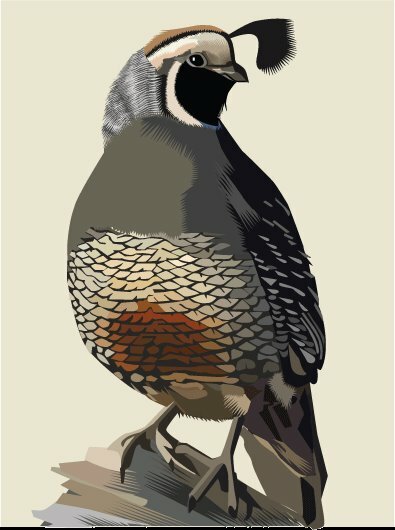 This California Quail in in the works. Not quite there yet...needs more work. This is one of a collection of birds I plan on doing during my stay at Syracuse...a pelican, maybe a kingfisher,a quail...some little birds. I am so inspired by Audubon--his strong design sense, his ability to alter the bird's gesture to really enliven the frame of the image, his strong patterning and ability to break the bird out into bold and simple shapes. A new bird has launched today in Las Vegas, a freerange bird! More on that tomorrow! This bird was created in Adobe Illustrator CS2.